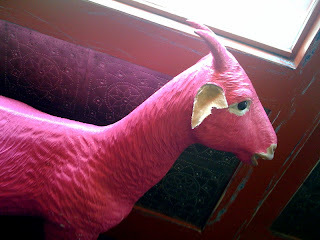 Cabrito (50 Carmine Street) sells $3 tacos during happy hour and has a weird pink goat in the window. But what really got us into this place was their three sangrias for $9 brunch special. The sign on the wall sealed the deal. We told you these signs outside the restaurants work. Our usual Sunday break. 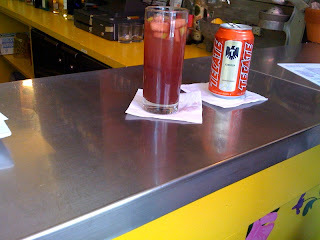 Sangria and Tecate at 3:00 PM at Cabrito. 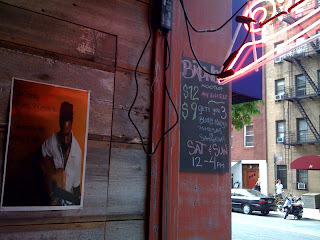 This was on our first visit to Cabrito a few months ago. At first we thought the Sangria special only applied to people who ordered brunch so I was only going to have one sangria. When the bartender asked me if I wanted a second one, I said "no thanks." He smiled and said "you know you can have two more for the price of one." My response, "well, in that case . 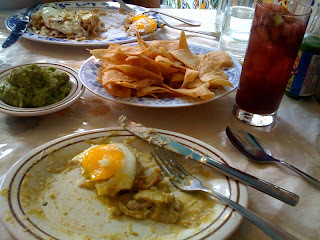 . ."
We were impressed with our first casual bar visit to Cabrito, that we wanted to come back for their food. And their $12 brunch menu was a bit different than the standard menu. 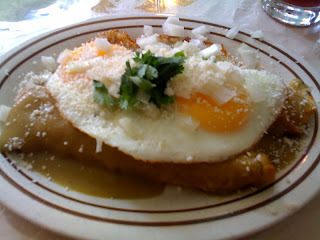 This Tomatillo Braised Chicken Enchiladas topped with fried eggs is a new take on breakfast. At first the portion seemed a bit small but it was really filling. The flavor was nice and the perfectly cooked eggs on top really added to this dish. 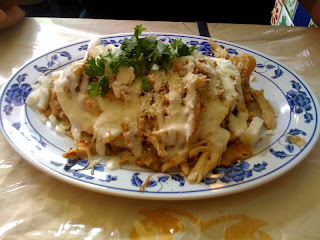 Unfortunately their Chilaquiles (braised crispy tortillas with fried eggs and salsa verde) with shredded chicken was a definite let down. The tortillas were soggy, the flavor was salty and it was just too rich and creamy. Thankfully Cabrito doesn't have the usual "let's make this place look like a Mexican restaurant" decorations, which can go overboard sometimes. 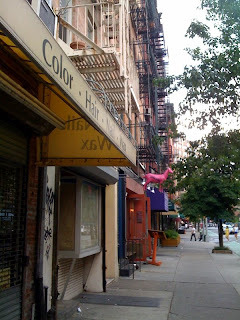 This is the West Village so you won't find the kind of cheap authentic food that you'd find at a place like Mexico 2000, but it's still another kind of good option when you're craving some Mexican food without having to get on the subway to do it. And how do you find this place? 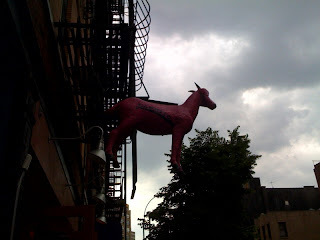 Look for the pink goat in the sky.